This trip, aside from driving to Walt Disney world from North Carolina, my wife and I will also be driving while on property. One, except for the Magic Kingdom, it will save us some time, which means more time to catch sleep when we can, and two, I am trying to relive some of my favorite memories of Walt Disney World. 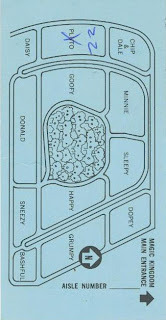 Included in those memories are a lot of little things, like pulling up the parking booths and paying to park. Sitting beneath those archways, I always felt like that was the moment we had arrived. Though we’ll have free parking because we are already staying on property, it will still be nice to relieve those moments under the arches and on the trams. 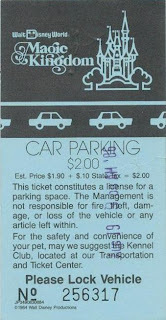 In honor of those parking lot days of old, here are a couple of old parking vouchers. 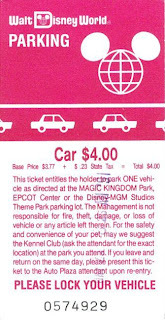 A Magic Kingdom ticket from 1984, and a Walt Disney World stub from 1989. Aside from having excellent parking prices, as opposed to the current twelve dollars per car, they are just plain cool looking. Oh, and if you have any of these little gems just piling up around your house that you’d like to get rid of, drop me a line, I’d love to add them to my collection. 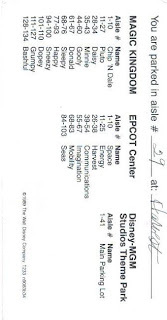 I hadn't seen any of the circa 1989 stubs before, the back side of that on eis interesting with the differnt names for the lots at Epcot, and the LACK of names at the studio.